An artist's conception shows a settlement taking shape as part of an asteroid mining operation. A new venture dubbed Deep Space Industries is jumping into the marketplace for asteroid mining — joining a billionaire-backed company called Planetary Resources in what they hope will eventually turn into a trillion-dollar business. In a press advisory, Deep Space Industries says it will create "the world’s first fleet of commercial asteroid-prospecting spacecraft." The venture also promises to develop a "breakthrough process for manufacturing in space." "Deep Space is pursuing an aggressive schedule and plans on prospecting, harvesting and processing asteroids for use in space and to benefit Earth," the company said in a press advisory. Further details came out in a news release issued early Tuesday, and a news briefing is scheduled for 10 a.m. PT (1 p.m. ET) Tuesday at the Santa Monica Museum of Flying in California. The briefing will be webcast via Spacevidcast and YouTube. Deep Space's CEO is David Gump, who has been involved in other space-themed companies including LunaCorp, which aimed to send rovers to the moon and also helped arrange one of the first TV commercials in orbit; Transformational Space, one of the early players in NASA's commercialization effort; and Astrobotic, one of the teams going after the Google Lunar X Prize. The company's chairman is Rick Tumlinson, who was involved in founding the Space Frontier Foundation as well as private space ventures such as Space Diving and Orbital Outfitters. Geoff Notkin, host of the Science Channel's "Meteorite Men" TV series, announced that he'd join the venture as well. One of the key questions relates to the venture's financial backing: Theoretically, mining the right kind of asteroid could produce precious metals worth sending back to Earth, such as platinum, gold and rare-earth minerals. Some asteroids also contain water ice that can be converted into fuel and supplies for space travel and settlement. Under the right conditions, such resources could be worth trillions of dollars a year. But it would cost billions of dollars to identify and exploit those resources. To cover such costs, Planetary Resources recruited a big-name investment group that includes Google's Larry Page and Eric Schmidt, software executive and spaceflier Charles Simonyi, Texan billionaire Ross Perot Jr. and Silicon Valley venture capitalist Ram Shriram. Planetary Resources also has a business plan that involves selling its Arkyd space telescopes as the first step toward profitability. Planetary Resources President and Chief Asteroid Miner gives an update on the developments with the Arkyd-100 Space Telescope and prospecting technology demonstrator. When Planetary Resources had its coming-out party last year, that company's executives said they planned to launch their first hardware in the 2013-2014 time frame. In a technical update released on Monday, the company's president, Chris Lewicki, didn't provide details about the launch schedule. But he did say there were "a number of exciting upcoming events," and indicated that the venture was currently concentrating on the development of low-cost prototype telescopes. "With each new prototype build, we’re learning a lot about how to strip cost out of the assembly, integration and test process, and that will be incredibly valuable when we start mass production of the units destined for space," Lewicki said. It's not yet clear whether Deep Space Industries will end up being a competitor for Planetary Resources — or a customer. But as with most outer-space ventures, the venture's financial underpinnings will be as much a key to success as its technological vision. "Deep Space Industries announced today that it will send a fleet of asteroid-prospecting spacecraft out into the solar system to hunt for resources to accelerate space development to benefit Earth. These 'FireFly' spacecraft utilize low-cost cubesat components and get discounted delivery to space by ride-sharing on the launch of larger communications satellites. "FireFlies mass about 55 pounds (25 kilograms) and will first be launched in 2015 on journeys of two to six months. Deep Space will be building a small fleet of the spacecraft using innovative miniature technologies, and working with NASA and other companies and groups to identify targets of opportunity. "Starting in 2016, Deep Space will begin launching 70-pound DragonFlies for round-trip visits that bring back samples. The DragonFly expeditions will take two to four years, depending on the target, and will return 60 to 150 pounds. Deep Space believes that combining science, prospecting and sponsorship will be a win/win for everyone, both lowering costs for exploration and enabling the public to join the adventure. "Bringing back asteroid materials is only a step on the way to much bigger things for DSI. The company has a patent-pending technology called the MicroGravity Foundry to transform raw asteroid material into complex metal parts. The MicroGravity Foundry is a 3-D printer that uses lasers to draw patterns in a nickel-charged gas medium, causing the nickel to be deposited in precise patterns. "Senior leaders at NASA have been briefed on DSI's technologies, which would make eventual crewed Mars expeditions less expensive through the use of asteroid-derived propellant. Missions would require fewer launches if the fuel to reach Mars were added in space from the volatiles in asteroids. Mars missions also would be safer with a MicroGravity Foundry on board to print replacements for broken parts, or to create brand new parts invented after the expedition was on its way to the Red Planet. "For example, a large market for DSI is producing fuel for communications satellites. Low-cost asteroid propellant delivered in orbit to commsats will extend their working lifetimes, with each extra month worth $5 million to $8 million per satellite. DSI has executed a non-disclosure agreement with an aerospace company to discuss collaboration on this opportunity. In a decade, Deep Space will be harvesting asteroids for metals and other building materials, to construct large communications platforms to replace communications satellites, and later solar power stations to beam carbon-free energy to consumers on Earth. 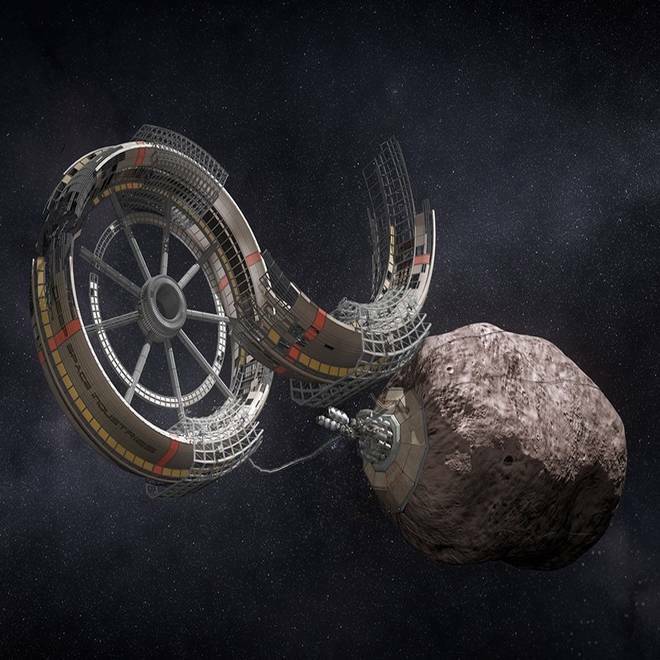 As DSI refines asteroids for in-space markets, it also will harvest platinum group metals for terrestrial uses, such as pollution control devices. "Asteroids that fall to Earth are meteorites, and the Deep Space team includes Geoffrey Notkin, star of the international hit television series 'Meteorite Men' about hunting for them. Notkin has unparalleled expertise in the diversity and market value of these elusive rocks, which are transformed by intense heat during their plunge to the surface. By contrast, the initial asteroid samples to be brought back by Deep Space will have their original in-space composition and structure preserved, creating exceedingly rare specimens for sale to the research and collectors markets. "Deep Space is looking for customers and sponsors who want to be a part of creating this new space economy. The company believes that taking the long view, while creating value, opportunities and products in the near term will allow it to become one of the economic engines that opens space to humanity. By getting under way and taking calculated risks, while developing basic industrial technologies, DSI will be well positioned over time to supply the basic needs of life in space. Taking the idea of socially minded companies to a new level, DSI is literally reaching for the stars. "'We will only be visitors in space until we learn how to live off the land there,' concluded Tumlinson. 'This is the Deep Space mission — to find, harvest and process the resources of space to help save our civilization and support the expansion of humanity beyond the Earth — and doing so in a step-by-step manner that leverages off our space legacy to create an amazing and hopeful future for humanity. We are squarely focused on giving new generations the opportunity to change not only this world, but all the worlds of tomorrow. Sounds like fun, doesn't it?" Stay tuned for updates after Tuesday's news briefing.